Secret files released today reveal dozens of reported sightings of UFOs over England, including lights which appeared over Glastonbury Festival in 2003. 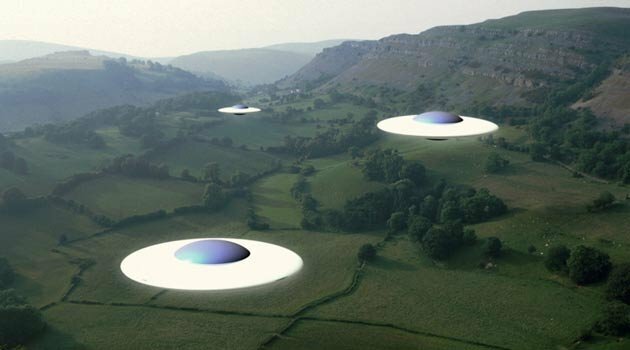 The files compiled by the Ministry of Defence (MoD) hold eye-witness accounts by concerned members of the public reporting mysterious objects such as ‘flying saucers’ and ‘worm-shaped lights’ between 1985 and 2007. UFO-related documents, including photographs, drawings and letters were compiled in a 9,000 page-thick file of evidence. However, though such evidence existed, MoD admitted that lack of funds and higher priorities prevented them from pursuing thousands of UFO claims further- eventually leading to the closure of the UFO desk at the MoD ten years ago. Here are some of the top unexplained sightings from files released by the National Archives. In the oddest case recorded, two women originally worried about a ‘potential terrorist attack’ in East Dulwich after witnessing ‘worm-shaped’ lights wriggling in the sky above their neighbourhood contacted the police. According to a testimony found in the unclassified files, police constables arrived with two men dressed in space suits and dark glasses referring to themselves as Mork and Mindy and told one of the women not to look at the object because of possible radiation and carried a transmitter which kept clicking. The two women were also asked not to talk to anyone in case of panic and offered to wash their eyes with a solution. The occurrence was reported to the MoD the next day and the pair subsequently complained to police that they had not been taken seriously. 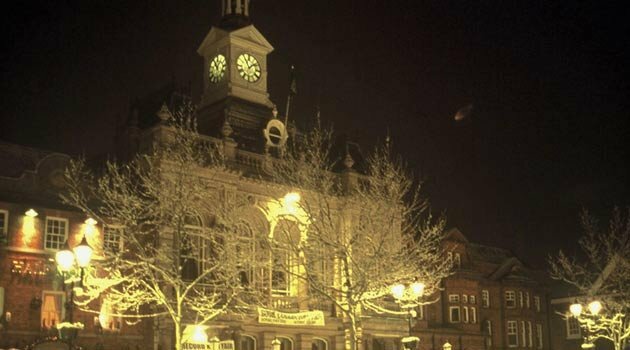 Intelligence defence experts were called to examine the photo below of a ‘flying saucer’ taken outside Retford town hall in Nottinghamshire. Photographer Alex Birch didn’t notice anything suspicious at the time of the snap, but having ruled out aircraft and lens flares, he contacted the MoD to investigate the image. But experts from the Defence Geographic and Imagery Intelligence Agency (DGIA) could not reach any “definitive conclusions” on the contents of the picture. Spooky. Correspondence between the MoD and the Belgian Embassy describes an incident in March that year where two F-16s were scrambled to investigate reported UFOs appearing on NATO radars. Following the scramble, no hostile or aggressive activities were said to be registered. A detailed account by a senior official from the Belgian Air force was recorded in the files. However, the incident still remains unresolved. In a similar incident, retired RAF Fighter Controller Freddie Wimbledon publicly described his role in a famous UFO incident involving the United States Air Force (USAF) base at RAF Lakenheath, in August 1956. In an account published by the RAF Radar Museum newsletter, Wimbledon said he was on duty at RAF Neatishead in Norfolk when the USAF reported a UFO on their airfield radars at Lakenheath. He recalled that the acitivity has been clearly seen on a radar and by observers on the ground. The RAF scrambled a Venom interceptor, controlled by Wimbledon’s radars to pursue the object which apparently ended up latching itself onto the plane. According to the files, a second Venom was then scrambled but it never got within 20 miles before the target sped off climbing at terrific speed. Wimbledon later revealed that all personnel involved in the incident were quizzed by HQ Fighter Command who stressed “absolute secrecy”.